Vincenzo Nibali (Liquigas-Cannondale) snatched final overall victory in the 2012 Tirreno-Adriatico with a strong performance in the final time trial in San Benedetto del Tronto. The Sicilian, who started the day in third place, posted a time of 10’56” on the completely flat out-and-back course; he was significantly faster than race leader Chris Horner (RadioShack-Nissan), who clocked 11’16”, and second place Roman Kreuziger (Astana), with 11’23”. This was more than enough for Nibali to overhaul his overnight deficit of six seconds to Horner, and just one to Kreuziger, but both had enough time in hand on fourth place Rinaldo Nocentini (AG2R La Mondiale) to hold to their places on the podium. “This is an important win. I’ve always dreamed about winning Tirreno-Adriatico,” said Nibali. “I’ve won stages but now I’ve won overall too, so I’m really happy. Having taken the Race of the Two Seas, Nibali is now setting his sights on the next big Italian race, where he will share responsibility with Slovakian champion Peter Sagan. “My Liquigas-Cannondale team is very strong for Milan-Sanremo,” Nibali said. “Me and Sagan will be the team leaders. He’ll focus on the final sprint, while I’ll have to do something before that. There are always a lot of surprises at Milan-Sanremo. The stage was won by former four-time World time trial champion Fabian Cancellara (RadioShack-Nissan), whose time of 10’36”, at an average speed of 52.641kph - set at the end of the first third of the 148 riders - effectively ended the stage as a competition with almost two hours worth of riders to go. The Swiss powerhouse beat an earlier time, set by RadioShack-Nissan teammate Daniele Bennati, by 12 seconds; late starter Cameron Meyer (GreenEDGE) edged just a fraction of a second ahead of teammate, Canadian champion Svein Tuft - the second man to start - to go third, 16 seconds back. Unfortunately for Meyer, his performance was not quite good enough to seize back the white, young riders’ jersey from Wout Poels (Vacansoleil-DCM), who was just eleven seconds slower. “It was a tough one,” said Cancellara, “especially when I had in mind my best time from last year; but the conditions today were totally different. The stage was made up of a completely flat, 9.3km, out-and-back course along the seafront of the Adriatic resort town; the same course used in the previous year’s race. A light southerly wind was blowing, meaning that riders would be blown to the turn by a tailwind, but would have to fight it all the way back. More hopefuls for the following Saturday’s Milano-Sanremo dropped out of the race at this stage, with Greg Van Avermaet (BMC Racing), André Greipel (Lotto-Belisol), and Luca Paolini and Oscar Freire (both Katusha) electing not to ride the short time trial, along with Tony Gallopin (RadioShack-Nissan). Alex Rasmussen (Garmin-Barracuda) was the first man off, but his time of 11’05” was immediately eclipsed by Canadian champion Svein Tuft (GreenEDGE), who was the very next rider, dropping it to 10’52”. Manuele Boaro (Saxo Bank) came within a fraction of a second of Tuft’s time but, almost half an hour after the Canadian had finished, Bennati - rider number thirty - went four seconds quicker with 10’48”. The Italian as only to stay at the top for a little over a quarter of an hour though, as RadioShack-Nissan teammate Cancellara - setting the best intermediate time of 5’14” - shattered Bennati’s time with 10’36”; catching Federico Canuti (Liquigas-Cannondale), who had started a minute before him, in the process. With Cancellara having blasted around his course, setting a time that nobody was to come close to, the stage was effectively over as a contest with more than a hundred riders still to finish. In the meantime though, another RadioShack-Nissan rider Hayden Roulston, and Team Sky’s Ian Stannard both pushed themselves close to the stage podium with 10’53” and 10’54” respectively. 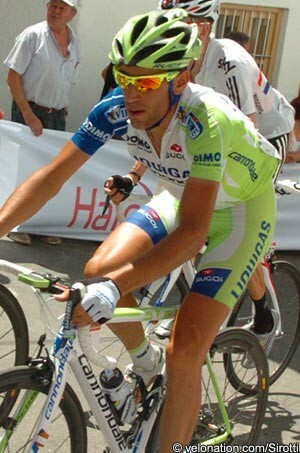 2010 race winner Stefano Garzelli (Acqua & Sapone) emulated Cancellara by catching his minute man, Pablo Lastras (Movistar), but could only manage to stop the clock on exactly eleven minutes; some 24 seconds behind the Swiss champion’s time. Of the late starters Meyer was the only rider to look like he was going to threaten a Cancellara victory; the young Australian stopped the clock on 10’52” however, 16 seconds slower than the Swiss champion, but marginally quicker than Tuft, to move himself into third place. Meyer needed to take twenty seconds from Poels to take back the white jersey that the Dutchman had taken from him the previous day. Poels posted a respectable 11’03” however, which was good enough to hold on. Joachim Rodriguez (Katusha), Johnny Hoogerland (Vacansoleil-DCM), Michele Scarponi (Lampre-ISD), Rinaldo Nocentini (AG2R La Mondiale) were all locked together in a battle for fourth place, with just five seconds separating the four riders overall. Nocentini’s time of 11’10” was enough for him to hold on to the position, but Hoogerland (11’14”) and Rodriguez (11’28”) both stepped over Scarponi, whose disappointing time of 11’31” meant he was almost caught by Poels. Roman Kreuziger (Astana) was already way behind at halfway - crossing the checkpoint in 5’34” - and the time ticked away as he entered the final few hundred metres; the rider that Horner had identified as his biggest threat slumped to a disappointing 11’23”. The Czech rider had lost out to Nibali, but it remained to be seen if he had done enough to unseat Horner and hold on to second overall. Horner looked to be going well, but he too was behind Nibali at the halfway point. The American’s time of 5’32” meant that the Liquigas-Cannondale rider was the virtual race winner, but Horner still might pull it back in the return leg. As Horner passed under the flamme rouge his time was up to 10’02” though, meaning that he would need a miracle final kilometre to hold on. The Italian crowd cheered as the magic figure of 11’03” ticked by - meaning that Nibali had won - and the American finally stopped the clock on 11’16”. Keuziger, whom Horner had thought was the bigger threat, actually finished seven seconds slower; meaning that the American was knocked off the top step by Nibali, but he held on to finish second overall in his first race of the season. “I have no mixed feelings about this,” said a happy Horner after the stage. “It’s been a fantastic week.